A California native, Alyssa Breslin (DPT ’18) spent several years working and volunteering in outpatient and inpatient physical therapy (PT) settings while pursuing her bachelor’s degree in kinesiology. 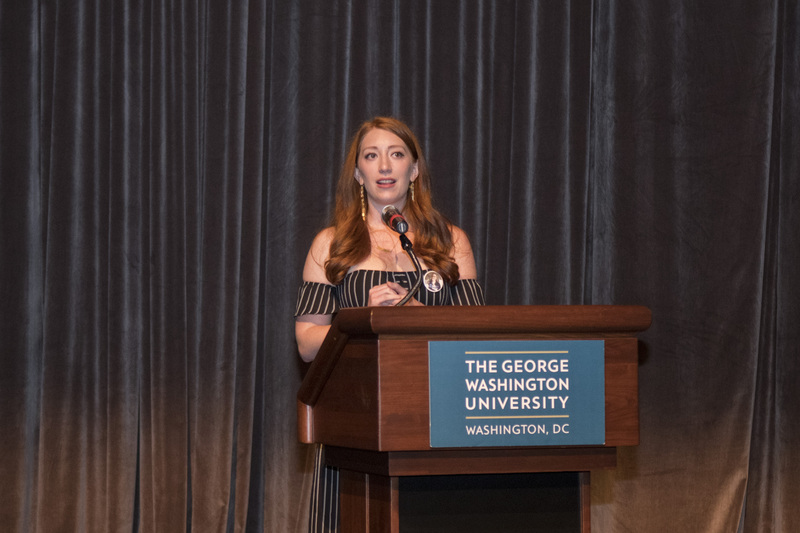 Upon entering the George Washington University (GW) School of Medicine and Health Sciences (SMHS) Doctor of Physical Therapy (DPT) program, Breslin, of Santa Rosa, California, found a shared love of physical therapy with other students, licensed PTs, GW alumni, as well as faculty and staff. She serves as the alumni representative in the Physical Therapy Student Organization and has hosted networking events for students and alumni. Breslin’s talent at bringing people together prompted her to start a Student Special Interest Group (SSIG) for the D.C. Physical Therapy Association. She and two classmates wrote the group’s charter and Breslin was elected vice president. Since its inception in April 2017, the SSIG has grown from 12 members to more than 40, with representation from Howard University DPT and GW DPT programs. It was this initiative and Breslin’s academic achievement that resulted in her receiving a DCPTA Rising Star Student Award in 2017. Breslin’s passion for community service led to her involvement in numerous volunteer activities including community health fairs, the Little Workers of the Sacred Heart Pro Bono PT clinic, and D.C. Challengers baseball team for developmentally delayed children and teens. She’s also a member of the PT Day of Service (PTDOS) Core Team, where she works on the Sustainability, Responsibility, and Support team. During her time at GW, Breslin has worked part-time coordinating the GW/MedStar NRH Neurologic Residency Program. She has also served as a student representative at the SMHS Senior Associate Dean interviews, prospective DPT student interviews, and at the GW Undergraduate HealthCare Career Dinner. Her commitment to the PT profession has led to attendance at conferences, including the Combined Sections Meeting, National Student Conclave, and Federal Advocacy Forum. Breslin is a member of the World Confederation for Physical Therapy (WCPT), APTA and its Neurologic Rehabilitation and Health Promotion and Advocacy sections. Breslin received a GW DPT Excellence Award in 2016 and 2017 for her achievements and dedication to the community, PT profession, and the GW DPT program.